In October 2011, project partners and team members in the Nile Basin Development Challenge met in Bahir Dar, Ethiopia to reflect on project progress and directions. 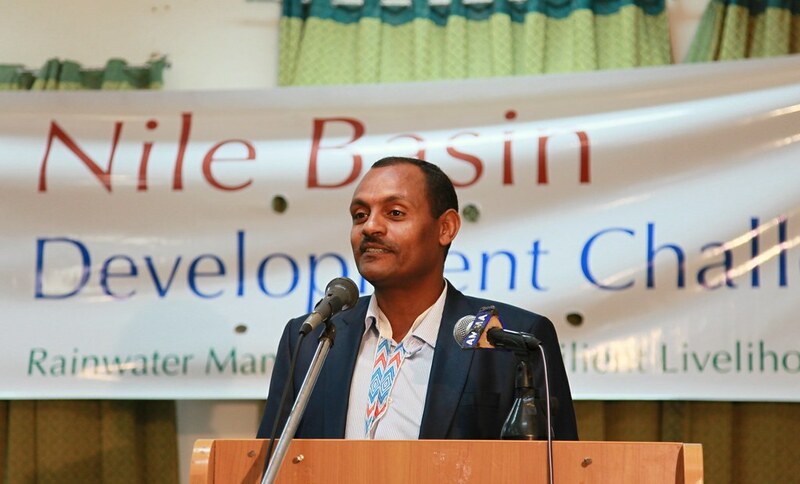 We asked Fantahun Mengistu, Director of the Amhara Regional Agricultural Research Institute (ARARI) to share some of the key points and take home messages from the meeting. Sustainability is a key issue, it needs increased participation of communities, more emphasis on showing short term benefits to farmers, increased attention to integrated hydrological planning at basin and landscape level – we need to ensure that people getting upstream benefits does not mean that people downstream will suffer. See photos from the workshop here. An innovation platform is a network of different stakeholders who come together to exchange knowledge and develop joint action to bring about change in livelihoods and natural resource management. The growing interest in innovation platforms recognizes that improvements to farmer livelihoods and environmental integrity depend not just on on-farm technologies but on wider institutions, markets and policies. Improved land and water management practices can often be more readily and sustainably achieved by addressing these wider issues than by a narrow focus on changing farmer behaviour, but addressing them requires the involvement of a wide variety of stakeholders from communities, government, NGOs, research and private sector. Although this approach may require more patience the results are likely to be more sustained and far-reaching. Developing market chains: bringing together different actors along the value chain including producers, input suppliers, traders and regulatory bodies can help to identify and address bottlenecks along the value chain. Addressing these bottlenecks can directly benefit producers and increase incentives for farmers to invest in more market-oriented production for improved livelihoods. Natural resource management enhancement: land and water issues tend to have a strong landscape dimension. The practices of upstream users can have important effects on downstream users. Also, small-scale irrigation schemes and soil and water conservation structures often affect multiple users and require collective action. Innovation platforms can provide a useful way of dealing with these landscape-level issues. Innovation platforms are more than just places to talk. They need to lead to changes in farmer practice if they are to be effective. For example, as part of the IFAD-Fodder Adoption Project an innovation platform in Ada’a focusing on livestock feed issues catalyzed increased use of improved fodder varieties but also led to sourcing of improved dairy breeds and enhanced milk marketing arrangements (see fodderadoption.wordpress.com). 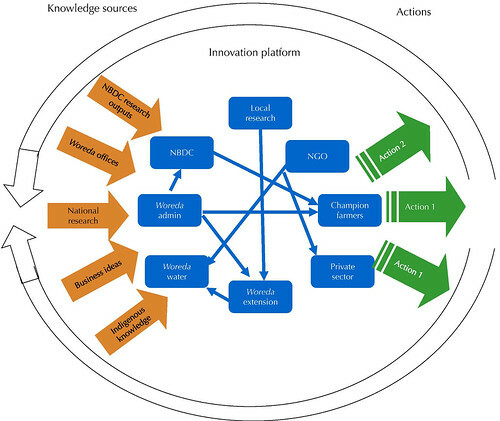 How could innovation platforms be useful in the NBDC programme? The NBDC programme proposes to catalyse formation of local innovation platforms in our three study sites of Diga, Fogera and Jeldu. We would see these meeting 3 or 4 times a year or as needed. They will bring together actors at woreda level such as various government line departments (including those responsible for agriculture and water), NGO’s, private sector actors, researchers, community representatives and others. The platforms could also include actors from outside the woreda as the agenda broadens. The aim will be to jointly identify constraints to improving land and water management at each site and then plan some practical joint actions to deal with them. The platforms would also provide a mechanism to seek resources to implement practical interventions identified within the platforms. As the platforms develop we could also link them to a national platform to provide a communication route to national actors. We seek local collaboration and co-development of these innovation platforms. We see the role of NBDC as catalysing initial formation of innovation platforms and then learning lessons about what makes them work. Theme 1 looked at rainwater management strategies and aimed to clarify the key concepts and shared undersatnding among the various teams. Theme 2 looked at various research and development processes key to the success of the projects: platforms, innovation systems, networking, learning, policies, and institutions. Theme 4 looked at water and productivity aspects – and modeling – to achieve a better understanding of the system at sub-catchment to basin scales. Theme 5 looked at environment and ecosystem impacts, examining how we link rainwater management strategies with broader environmental health and ecosystem functions and notions of resilience. During the sessions, we organized three ‘hard seat’ interviews with colleagues attending the workshop. The final session looked across the projects at issues of communication and capacity building and reflected on progress towards the workshop objectives. In the synthesis session Shirley Tarawali (see below) highlighted two overall lessons from the workshop discussions: First, the broad science concepts have been articulated but still need to be translated into practical realities on the ground. Second, issues of cross-project and cross-theme integration need to be addressed realistically to ensure synergies. The River Nile Water is the lifeblood for 180 million people who live in the river basin. Nile water supports hydropower, agriculture, navigation, and a multitude of ecosystem services all essential for economic growth, poverty reduction, and stability in the region. The region has the potential for rapid growth, and many individuals, communities, companies, and countries have high hopes that the Nile waters can support growth and prosperity. While the future expectation of what the Nile can deliver to its people is extremely high, in fact the resource is limited, and there is a real danger that ill-planned development can lead to degradation and conflict. This book by Assefa M. Melesse covers a range of biophysical issues important for the Nile basin: water budgets of the major lakes, satellite rainfall data, climate variability, tradeoffs in water use and productivity, and water scarcity. Livestock-water productivity in the Nile Basin: Solutions for emerging challenges by Tilahun Amede and colleagues provides a framework to improve returns from water investments through: (i) provision of sufficient watering points for livestock across the basin; (ii) improving water productivity through promoting water-saving technologies, ensuring system integration and control of transboundary flux of livestock diseases; and (iii) formulating participatory basin scale regulatory frameworks on water use and sharing. It also argues that improving water productivity through integrated technological, policy and institutional interventions offers an opportunity for smallholders in both upstream and downstream countries to adapt to climate and market risks. Hydrological water availability, trends and Allocation in the Blue Nile Basin by Matthew McCartney and colleagues provides an overview of the basin characteristics, hydrology and hydrological variability of the Blue Nile, as well as a brief evaluation of the current and future status of water resource development and implications for water availability. From 4-6 May 2011, project teams from the Nile Basin Development Challenge meet in Addis Ababa in a ‘science and reflection workshop.’ We asked Deborah Bossio from the International Water Management Institute (IWMI) to explain the purpose of this meeting. Why this meeting? According to Bossio: The NBDC was launched just over a year ago and this meeting is an opportunity for participants to review progress, gaps and plans. First, to get clarity on the key ‘rainwater management’ concepts and frameworks for analysis and how these are best made operational across the various NBDC projects. She highlights scale as a major research challenge – we work across various scales, from local, through landscapes, to basins, with impacts beyond. We need to be sure our analysis and results work across scales. Second, to examine our experiences with key enabling processes, such as innovation system platforms, policy dialogues, co-learning processes, and stakeholder workshops. The 3 main outcomes she aims for are: 1) common understanding among participants of basic concepts and frameworks; 2) ideas and plans how we can take forward the results already emerging from the various projects; and 3) an assessment of our scientific progress, the quality of the research, and gaps identified that need attention.